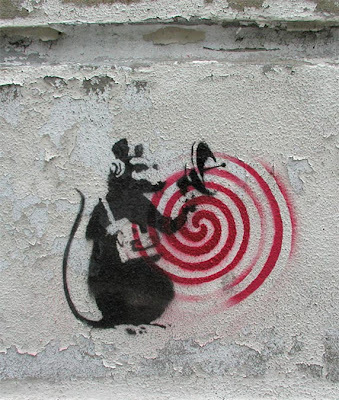 Ananka's Diary: NYC Rat Related News! Rats have taken over Manhattan's City Hall Park. According to The New York Times, they scamper about in broad daylight, just yards from the mayor's office. As the reporter noted, "They also seem unafraid of people and at perfect ease in their surroundings, sometimes appearing as playful as squirrels." (Squirrels! I knew those wily little rodents were involved somehow.) The pictures that accompany the article show the park's rats at having a merry old time, sprinting through the grass and weaving between unsuspecting visitors' feet. According to the experts, the abandoned subway station (more on that later) and tunnels beneath City Hall Park offer the rats an ideal shelter. Though they're usually nocturnal, these rats emerge in the afternoon as people flock to the park to enjoy their lunch. They steal whatever scraps they can, and then slink back to their underground lairs. If you aren't already completely disgusted, you can read more here. "Photo by Tyler Hicks for the New York Times"
Who won American Idol a while ago? Hey Luz, think you can make a couple million Reverse Pied Pipers for the NYC population?